Apple has cemented its place atop the American Customer Satisfaction Index, a sort of Michelin guide for customer service, for the eleventh straight year. 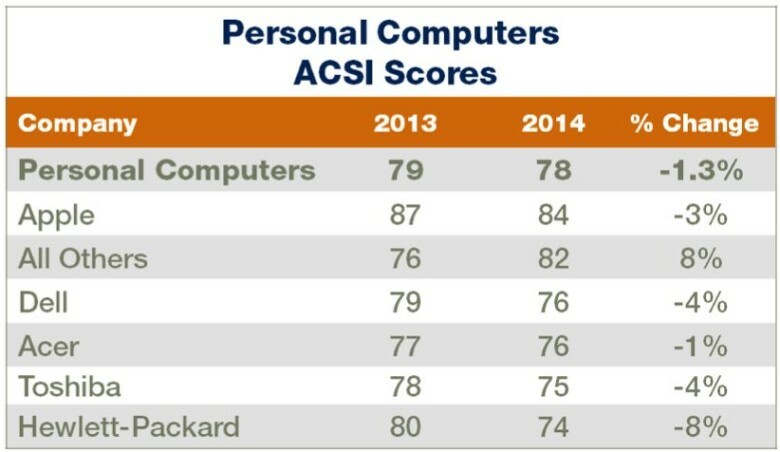 In a new report released by ACSI, Apple continued its lead over big name rivals such as Dell, Acer, Hewlett-Packard and the catch-all “All Others” when it comes to satisfaction with computing devices — including desktops, laptops and tablets. Scores are based on everything from pre-sale customer expectations, to perceived value and quality, customer complaint incidents and overall consumer loyalty. While Apple did reign triumphant, however, it did 3 percent from last year to an overall score of 84, which the American Customer Satisfaction Index attributes to the most recent generation of iPads not improving “all that much from earlier versions” — despite excellent reviews. Not bad, Apple. Not bad.